Jordan & Judy (referred to as “J&J”) is a creative design-based fashion brand. It focuses on innovative thinking and the modern design of products, upholding the spirit of innovation and change to create exquisite goods of value and a new fashion experience. It aims to deliver an artistic atmosphere to modern families and provide a more interesting, beautiful and comfortable lifestyle. 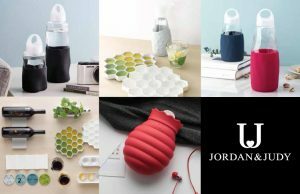 Based on their attention and respect to the details of life, Jordan & Judy balances realistic consumption demands with innovative and modern product design. The brand tries to restore the original meaning of articles to render life fun and comfortable, allowing every like-minded person who pursues quality to have an emotional connection, hence rekindling the curiosity and passion for life. Based on keen attention and respect to the details in life, Jordan & Judy balances realistic consumption demands with innovative and modern product design. J&J consumers are positive, optimistic, and bold in trying new things. They pursue individuality and taste, have their own unique perspective on life, and desire to enjoy a quality of life that is in sync with the soul.